Only a few days left until the Isabel Marant for H&M collection goes on sale and I can hardly contain my excitement! There are only two stores that will be selling the collection in the DC area, M Street and F Street. Lines are expected to be long, so you might want to show up extra early. Doors open bright and early at 8am on November 14th or you can try to score some of the collection online, either way good luck! I will be covering the madness at the Georgetown location, see you in line! 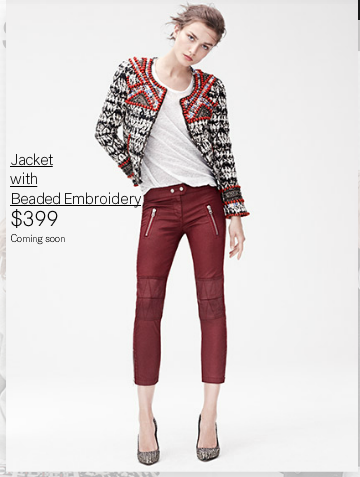 I am hoping to score these red leather pants, let’s be honest I will pretty much take anything I can get my hands on. How early do you think people will be lining up at the Georgetown location? I was in line with you, right behind you in fact (on the nubby cardi quest!, btw nice to meet you!). You know what I realized when I got home? They didn’t have the signature beaded jacket or the sequin pants. I bet they are in a box in their stock room. On the web site they said the stores participating would have every item in the collection. Hey! It was so nice to meet you today! Thanks for checking out my blog! The new post is up now and I think you are in it. http://fiftytwothursdaysdc.blogspot.com/2013/11/isabel-marant-at-h-georgetown-fighting.html Yeah those sequin pants are to die for..I guess we can try online?